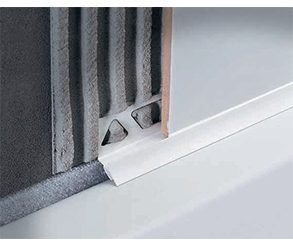 KERAJOLLY profiles are utilized to define the sharp external wall corners during tile laying. They protect the more fragile single firing tile edges or borders. KERAJOLLY allows the layer to execute his work rapidly and precisely with the only task of choosing the proper size of the profile in respect to the thickness of the tile. MOSAICTEC LIM 51 decorative listello in aluminium for vitreous mosaic with reduced thickness. This innovative profile perfectly integrates with the grout line, without displacing the mosaic covering pre-existing joints, and thus creating beautiful aesthetic effects, both horizontally and vertically with a high flexibility in the tiling pattern. The profile particular section allows its installment just with a simple widening of the tesseras, which once returned in their former position keep the profile in the right position, without modifying the joints interax. A simple solution to customize the mosaic adding a special touch also to the standard, easy to find versions. 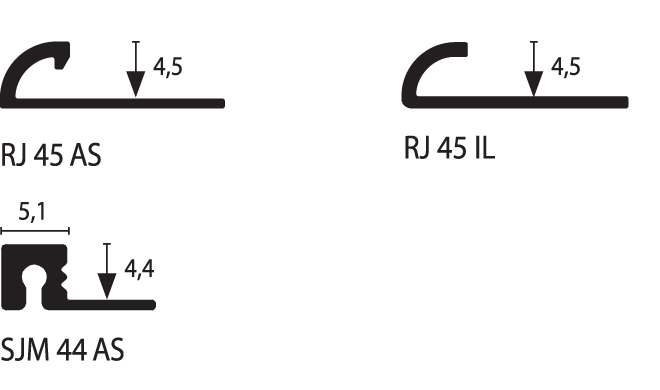 ROUNDCORNER RO series comprises several corner protectors with rounded edge in order to best protect in compliance with the accident and injury prevention norms. In fact this profile is greatly used in commercial and industrial areas where intense transit occurs. 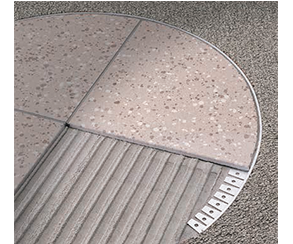 ROUNDCORNER can perfectly cover over chipped tiled corners and are supplied with self-adhesive glue strips with excellent hold which help absorb shock impact. 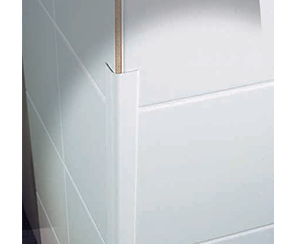 INTERJOLLY optimizes the corner joining of the tile covering between floor and wall, while leaving the necessary space for the expansion with adjacent walls. This profile has a perforated flange which is applied under the tile. It can also serve as a cove base for shower tray and bathtub perimeter so to avoid the silicon lining which inevitably turns a yellow unaesthetic discoloured tone in time. The moulded cove base made with the application of the profile makes every internal corner and crevice extremely easy to clean and therefore more hygienic. 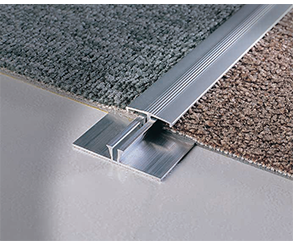 TRIMTEC TR is a complete range of brass, aluminium and stainless steel trim profiles designed to allow a faster and proper laying of floor coverings independent of tile size or type of finishing and edging required. 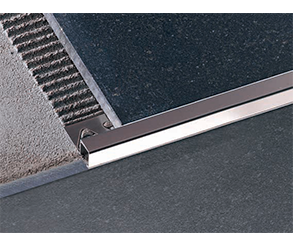 TRIMTEC TR is supplied in different heights ranging rom 2 mm to 30 mm to match the thickness of tiles normally produced. 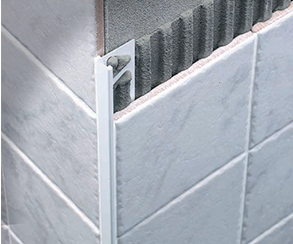 In the aluminium and brass version, the dovetail internal cavity groove of the profile improves the grip action of the grout whether for vertical or horizontal tile laying. 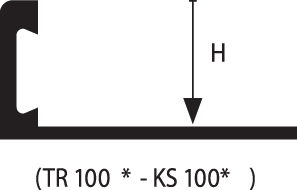 Technical and design profiles for finishing stairs using ultra thin tiles. Completing and protecting the steps from mechanical impact. With the ROUNDJOLLY® one can achieve a round, safety approved and symmetrical finish. SQUAREJOLLY SJM gives a square finish. 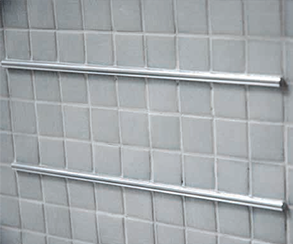 Ideal for residential and commercial applications. 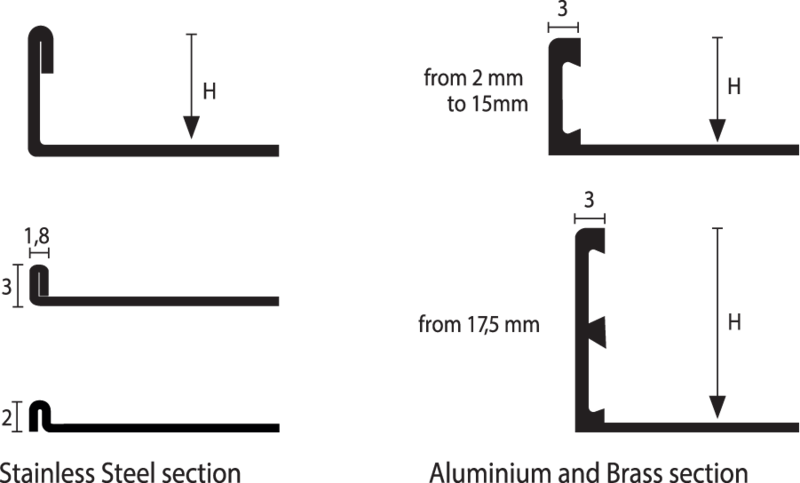 Squared section profiles in stainless steel for the protection and finishing of the tiled steps edge from bumps and mechanical impacts. Minimal and modern design. Ideal for domestic and commercial environments. 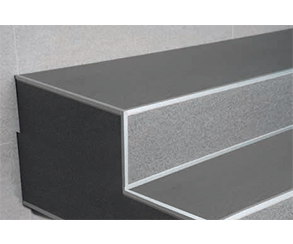 The particular design of SJ profile by Profilitec .p.a, with the 2 vertical sides directly in touch with the adjacent surface make them suitable also to be used for walking steps and avoid the profile bending. 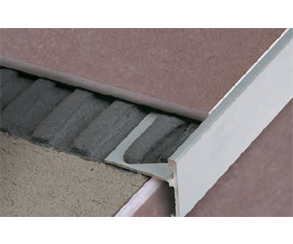 TRIMTEC SR is recommended in particular for finishing the edges of the perimeter of the ceramic floors, especially where they abut to vertical covering, or as stair nosing, as well as for trimming external access ways and balconies. SR trim has an extended vertical edge which serves to better cover and protect the joining surfaces or paint finishing as well as to prevent future fissuring. Its particular section design makes it suitable to match two different floor thicknesses with the same reversible profile. Vertical dovetail anchorage. Jointing profile with a fixing base for before carpet laying and top strip with grooved surface to be interlocked onto the base bar once the carpet is laid. 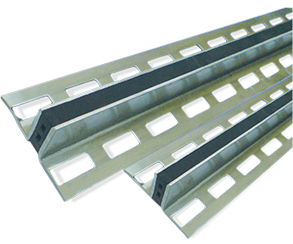 Toothed base bar o pre-drilled is available.The base and the upper top are two different articles to be ordered separately.